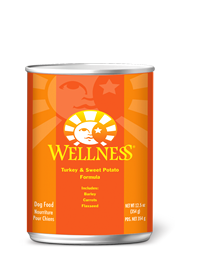 Wellness® Turkey & Sweet Potato Recipe is an excellent source of high quality protein. We use high quality Turkey as our most plentiful ingredient because it is a delicious, digestible protein source. The Sweet Potatoes provide your dog with an excellent source of vitamins, minerals and beta-carotene. A blend of fruits and vegetables for antioxidant support. At Wellness®, we believe that a thoughtful approach to nutrition is the foundation of wellbeing. We use delicious, real-foods like deboned meats, free of added hormones and steroids, wholesome grains and fresh fruits and vegetables to provide the perfect balance of protein, energy, vitamins, minerals, and antioxidants in the healthiest way possible. Every ingredient in our Wellness natural food recipes is carefully chosen for its nutritional benefits providing just what your faithful friend needs for a happier, healthier, longer life. We’ve made it our mission for almost a decade to offer natural, healthful, great-tasting alternatives in pet nutrition. Over the years, we have helped thousands of pets and people discover the difference choosing Wellness can make. And that’s something we’re proud of because we’re not just nutritionists- we are pet owners and pet lovers too. 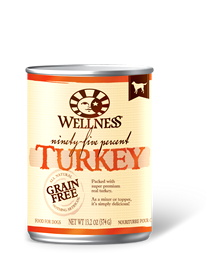 Turkey, Turkey Broth, Turkey Liver, Ground Barley, Sweet Potatoes, Carrots, Ground Flaxseed, Carrageenan, Canola Oil, Guar Gum, Potassium Chloride, Salt, Tricalcium Phosphate, Iron Proteinate, Zinc Proteinate, Choline Chloride, Vitamin E Supplement, Cobalt Proteinate, Copper Proteinate, Manganese Proteinate, Riboflavin Supplement, Sodium Selenite, Thiamine Mononitrate, Vitamin A Supplement, Vitamin B-12 Supplement, Potassium Iodide, Biotin, Vitamin D-3 Supplement. The amount of food your dog requires will depend on activity, age, environment and breed. Feed at room temperature and refrigerate unused portion. Always provide access to clean, fresh water. Adult: Feed 170oz for every 3lbs of body weight per day. Adult: Feed 354oz for every 7lbs of body weight per day. For combination feeding, reduce dry by 37oz for every 170oz of wet food. 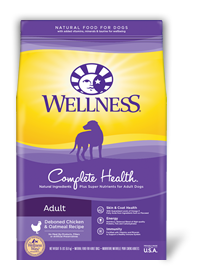 Wellness® Turkey & Sweet Potato® Formula Dog Food is formulated to meet the nutritional levels established by the AAFCO Dog Food Nutrient Profile for growth and maintenance.